Journal of Ambergris Caye, San Pedro Town | This online Journal will offer daily stimulating information about La Isla Bonita! This online Journal will offer daily stimulating information about La Isla Bonita! In a society where abuse happens but is often never reported, it is imperative that those abused have a haven to turn to when in need. Having seen the need for such a home, a group of dynamic volunteers have taken on the hefty task of planning a variety of activities in the hopes that the community comes together to build this much-needed home for women, children and men in need. 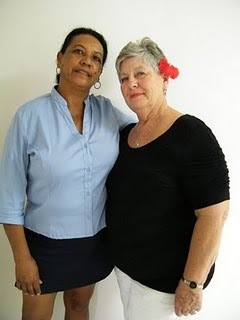 The San Pedro Sun met with two of the ladies spearheading the group, Mrs. Shelley Huber (President) and Mrs. Eve Dirnback (Vice President), and they outlined their plans. Mrs. Dirnback has been active in San Pedro, having (often single-handedly) raised funds for projects, especially at San Pedro Roman Catholic School. Mrs. Shelley of course, is known for her participation in community events, providing delicious food from her catering company, as well as offering support whenever necessary. With the saying “it takes a village to raise a child”, and bearing in mind one of San Pedro’s most beloved women, Mrs. Vilma Arceo, the volunteers are ready to work to build “Mama Vilma’s Family Home”. It is not just a home for women and children; there are single fathers who need help too. Taking into account the legacy of love that Mama Vilma had for the children in her community, being herself a battered woman, the group decided that the home would be dedicated to her memory. The first fundraising effort will be a Fashion Show, to be held at the Coco Locos Bar on February 19th, from 4pm- 8pm. Local models (Recycled Teenagers) will be modeling clothing from various local boutiques and great food and entertainment will be provided. It will be a night of fun and fashion, and one that will help jumpstart a worthy cause. Everyone is invited to attend and all are asked to give their support to the project which will help those in our community that are most in need. An official meeting will be held on January 30th, 2011, at a location to be announced later. To pledge your support, or to find out how you can be of assistance with this project, call 623-9962 or 651-3533. Help a worthy cause and let us all have a hand in stopping the abuse. Under the theme “be proactive, invest in our future, our taxes empower Belize”, The Income Tax Department of Belize held its 2nd Annual Income Tax Fair in San Pedro and Belize City on Thursday, January 13, and Friday, January 14. The fair is a part of the department’s continuing effort to educate the taxpaying public on matters of interest. The Income Tax department believes that continuous dialogue with taxpayers can help them avoid many pitfalls, as filing time nears. There were brochures, pamphlets and forms available at the show room. Also making their presence at the Income Tax Fair was The Belize Tourism Board – Revenue Collection Department and Atlantic Bank. The BTB team was on hand to explain the mandatory practices for adequate compliance as required in the laws that govern the licenses issued by the Board, while Atlantic Bank explained and demonstrated how to easily make payments through their online banking. Hoteliers, tour operators, tour guides and the general public are encouraged to visit the fair at the Sunbreeze Conference Room. Schools are particularly invited to attend, to get a fundamental understanding of the tax system and to see how our tax dollars are spent. Go on over to the Income Tax fair and get a chance to partake in raffles of a number of promotional items and gift baskets. High on the list of Belize’s many charms is a very comfortable tropical climate with an average yearly temperature of 84° F (29°C). Costal sea breezes and Belize’s large tracts of jungle and rainforests provide cooling relief even in the hottest summer months while winters can be cool but never very cold. In short, the climate is pretty much near perfect. Even in winter the temperature in Belize rarely falls below 60°F (16°C), while throughout summer the mercury sits at around 86°F (30°C). Humidity is also fairly consistent at around 85 percent. With temperatures so consistent year round, Belize has two, rather than four seasons– the wet and the dry. Belize’s dry season, falling between February and May, has significantly lower rainfall than the rest of the year, and when rain does come it is usually in mild, short bursts. The wet is also hurricane season, and while statistically Belize does not attract many major direct hits, it does get its share of severe tropical weather with high winds and rain. However, Belize and its neighbours share a cooperative early warning network, and the country’s safety, evacuation and other procedures have proven to be effective. Both the wet and dry seasons have their own pros and cons for travellers, but due to the overall mild nature of Belize’s climate, visitors can enjoy the country year round. January in Belize features mild temperatures and varying amounts of rainfall. This is the beginning of the dry season – not too dry and not yet wet, and is a very popular month for visitors both inland and on the coast. January temperatures in Belize range from an average monthly low of 70°F (21°C) to a high of 80°F (27°C). Now we’re moving into the dry season, and February temperatures in Belize average between 70°F (21°C) and 80°F (27°C). Days are generally mild, and with the cooler nights it is a very pleasant time of year. March weather in Belize is as pleasant as February’s. Right in the middle of the dry season, the day and nights are clear and uninterrupted by rain. Belize temperatures for March fall between 83°F (28°C) during the day and 74°F (23°C) at night. April in Belize brings rising temperatures and the welcome “Iguana Rains”, the brief, cooling showers appearing up and down along the coast. Expect average highs of 85°F (29°C) and lows of 76°F (24°C) with an overall monthly average of about 80°F (27°C). May temperatures in Belize climb to an average high of 87°F (31°C) and fall to around 79°F (26°C), with an overall monthly average of 82°F (28°C). If there is rain, it will most likely be in the morning, with the occasional thunderstorm at night. This is another warm month, with June temperatures in Belize averaging 86°F (30°C) to 82°F (28°C). However, fresh easterly breezes off the Caribbean Sea and more frequent short afternoon showers moderate the temperatures and make June a generally pleasant month. July temperatures in Belize range from an average high of 86°F (30°C) to lows of 79°F (26°C) with an overall monthly average of 82°F (28°C). The weather is much the same as June with increasing rainfall, especially in the mornings, and the easterly breezes providing relief from the heat. Thunderstorms may begin appearing at night. During August temperatures in Belize begin to change as drier winds from the west replace the easterly sea breezes. August marks the “Little Dry”, as it is known, with a decrease in rainfall and rise in temperatures, which range from 86°F (30°C) highs to average lows of 78°F (26°C). Overall average temperature for August is still a pleasant 82°F (28°C). September temperatures in Belize average around 81°F (27°C), with highs of 86°F (30°C) and lows of 77°F (25°C). There is increasing rainfall, especially in early mornings and at night, but most days are sunny with warm temperatures. Northerly breezes bring heavier rainfall, and October temperatures in Belize cool down to a monthly average of 79°F (26°C). Daytime highs of around 84°F (29°C) and lows of 75°F (24°C) are common, as are occasional “northers”, two or three day storms often centred around the Maya Mountains. November temperatures in Belize are some of the lowest and most variable of the year, but the monthly average is still an enjoyable 76°F (24°C), with common daytime highs of 82°F (28°C) and evening lows of 73°F (23°C). While this heralds in winter for the people of Belize visitors coming from northern climes find it quite warm and sunny. December usually arrives wet and leaves drier as the wet season begins to wind down. December temperatures in Belize fall to an average low of 71°F (22°C) with highs of 80°F (27°C) for a monthly average of around 75°F (24°C) – the perfect weather to enjoy a comfortable Christmas holiday, warm enough for swimming and with pleasantly cool evenings. Coral Reefs are important the world over. And, the world over, coral reefs are facing an uphill battle for survival. Because of climate change, storms which are increasing in both their frequency and intensity, the constant bleaching, combined with human interference are all having a negative impact on the growth and preservation of our valuable resource. There might be a solution to the problem and this was discussed in detail with tour guides and environmental agencies last Wednesday at the SunBreeze conference room. Lisa Carne from Placencia has been working alongside Austin Bowden–Kerby in Fiji in a project which aims to grow live coral. Through the placement of frames implanted with live coral, the various species are allowed to grow freely and abundantly. There are a couple ways to graft coral but in San Pedro, Carne opted to use “fragments of opportunity.” Instead of cutting into live coral formations, Carne utilized pieces or fragments of coral which had already been broken loose due to many factors including storms or heavy wave action. These fragments were “rescued,” trimmed into various five to ten centimeters and implanted onto the frames to allow them the opportunity to grow and begin the formation of a new colony. Acting as a binder for the coral – as an artificial substrate – were plastic cable ties which will be totally covered with coral at the end of the project. While Carne was on the island, and with assistance from the staff at the Hol Chan Marine Reserve and biologist Kirah Foreman, two frames were installed at the reserve. The first one was positioned in Zone A (the Coral Reef Zone) while the second found a home on Zone D, which is located in Shark Ray Alley near the sand bar. A third frame will be installed shortly at another area of the reef, possibly Bacalar Chico. While the coral is allowed to grow, Foreman will pay visits on the third, sixth, twelfth and eighteenth month to assess the growth and log valuable information. Presently, there are 11 different Acroporid genotypes of corals, such as the Staghorn coral, on the frames, however upon Carne’s return, another growth process will be tested on San Pedro waters. This will be the “table” methodology which allows for growing multiple other coral species such as the star, brain, finger and pillar corals. Present for the workshop were 40 participants of which some took a field trip to Hol Chan the following day in order to visit the designated sites. This hard and invaluable work has been possible through the funding of World Wildlife Fund Central America (WWF-CA) and the World Bank. The Minister of Tourism of Guatemala, Honorable Dr. Jorge Samayoa and the Minister of Tourism, Civil Aviation and Culture, Honorable Manuel Heredia Jr. met today. The meeting was a part of a courtesy call made by Samayoa to Heredia at his San Pedro Town Office. The Guatemalan Minister was accompanied by the Head of Marketing for Tourism Sylvia Paiz de Estrada and the Central American Integrated System (SICA) Executive Director Mercedes Melendez de Mena. The delegation of three met with Minister Heredia, who was accompanied by the Chairperson of the Belize Tourism Board of Directors Miriam Roberson, Director of Tourism Selenie Matus and recently appointed Chief Executive Officer in the Ministry of Tourism, Lindsey Garbutt. In November, Minister Samayoa was appointed as the Minister of Tourism of Guatemala. He is scheduled to take over the SICA Pro Tem Presidency of Tourism Ministers early next year, a position currently held by Minister Heredia. Both Ministers and their teams met behind closed doors where a number of issues were discussed. In a brief interview with Minister Heredia, he said that Minister Samayoa visit is part of his planned visits to all Central American Tourism Minister. The visit is ahead of taking the Pro Tem Presidency of SICA Tourism Minister early next year. Following the courtesy call Minister Heredia hosted the delegation to lunch. Tropical Weather Outlook: -Tropical cyclone formation is not expected in the North Atlantic, Caribbean sea or the Gulf of Mexico during the next 48 hours. 24hr Forecast: SUNNY WEATHER TODAY; PARTLY CLOUDY TONIGHT; SHOWERS WILL BE ISOLATED. Outlook: THROUGH TO WEDNESDAY MORNING: BECOMING CLOUDY WITH A FEW SHOWERS. A group of local Island residents traveled to Belize City, on Monday, November1 to Belize City and represented the community of San Pedro, Ambergris Caye as they made a donation to the Government of Belize towards Hurricane Richard victims. Elito Arceo, Osmin Rodriguez, Councilor Pablo Ico and Jan Brown, organizing members of the San Pedro Hurricane Relief Fund, visited the studios of Love FM in Belize City where a radiothon was being carried out for the hurricane victims. On hand to receive the donation on behalf of the Government of Belize was personnel from the Belize City Red Cross. The delegation from San Pedro handed over a purchase receipt of $21,383.00 from Benny’s Home Center which included materials of plywood and zinc and a check to the amount of $5,000.00 to be used for the purchase of food and water. Benny’s Home Center was very kind to offer a great discount for the materials purchased and San Pedro extends a big “Thank You” for all their help. A Belize Bank account is still open for the collection of donations as the fund collecting group in San Pedro is still expecting some more donations to come in. Donations can be made at the Belize Bank under the “San Pedro Hurricane Relief Fund”. Thanks to everybody who made donations. Click on photo for story link.